The English Toy Spaniel is a happy, gentle, loving, playful and quiet dog who wants to be your closest friend and cuddle in your lap. He bonds very closely with his owner. He needs attention and affection and can't be left alone for too long. He is sweet and loving in return, eager to play with you, to please you, and to be your calm companion. He wants to be around people but can be shy with strangers. He warms up quickly when approached in a loving and gentle manner. Since he is a gentle dog, he also needs to be trained with a loving hand. He can sometimes be stubborn or mischievous, but is usually well-behaved, obedient, and quick to learn. He is not a good watchdog because he doesn't bark a great deal, and because of his shyness. He gets along well with other dogs and pets. He is patient and playful with children, but might be too gentle for very young children: they will need to treat him very kindly. He doesn't like rough teasing and he might bite if he becomes frightened or overwhelmed. He is a low-energy dog who likes to relax or play ball in the house, but he does need to run around in a fenced yard from time to time, and to go out for a walk. He should always be leashed while walking because he will chase small animals and birds due to his natural hunting instinct. He can sometimes be a picky eater. He sheds quite a bit of hair, so might not be a good pet if you are worried about dog-hair in the house. The English Toy Spaniel is 9 to 10 inches tall (to shoulders) and weighs 8 to 14 pounds. He has a medium-length, silky coat that can be either straight or slightly wavy. His coat color can be red, red and white, black and tan, or white with black and tan. The English Toy Spaniel (also known as the King Charles Spaniel) is probably descended from Pug dogs from ancient China or Japan. He arrived in Europe during the Middle Ages, and grew to be very popular during the reign of King Charles II of England, in particular with the nobility of the time who wanted an affectionate dog who could also hunt small birds. During the 19th century he was bred to be a smaller dog. 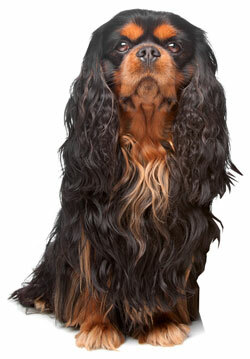 The English Toy Spaniel Club was established in 1886, and the breed was admitted to the AKC that same year. His AKC popularity was 121st out of 157 breeds in 2007.